Cut apples in half lengthwise. Using spoon, remove and discard cores, making at least a 1-inch (2.5 cm) indentation in each apple half. In microwavable pie plate, arrange apple halves, cut sides up. If needed, cut thin slice off bottoms to keep halves from tipping. Fill each apple half evenly with raisins and brown sugar; dot with butter. Cover with microwavable plastic wrap, folding back one edge 1/4- inch (6 mm) to vent steam. Microwave on High 5 to 6 minutes or until apples are tender. Top each with granola. Serve with milk, cream or yogurt if desired. 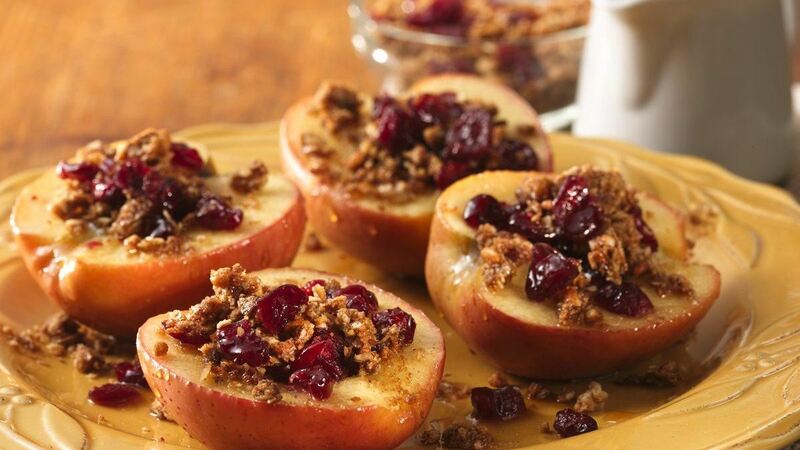 Tip: Traditional baking apples such as Granny Smith or Rome Beauty can also be used for a less-sweet taste. Easily crush the granola bars right in the pouch with your fingers or rolling pin.